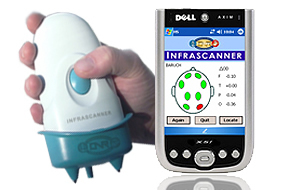 Infrascan Gains FDA Approval For Its Hand-Held Intracranial Haematoma Detection Device. US company Infrascan Inc has announced attainment of FDA approval for its Infrascanner Model 1000. This is the first hand-held device intended to aid in the detection of life-threatening intracranial hematomas, using near-infrared spectroscopy. The Infrascanner Model 1000 can help health care providers identify which head trauma patients require immediate CT scan, thereby speeding their access to treatment. Where CT scanning is not readily available such as in remote locations or healthcare systems without the funding for expensive technology, Infrascanner could provide a low cost, albeit less accurate alternative. Intracranial hematomas occur when blood from a ruptured blood vessel collects within the brain or between the skull and the brain. As blood expands within the brain or in the narrow space between the brain and the skull, the brain becomes compressed. This can produce symptoms such as headaches, vomiting, dizziness, lethargy, weakness in the arm or leg on one side of the body, seizures, or unconsciousness. An intracranial hematoma can be life-threatening if it is not treated immediately. Infrascan Inc gained CE Mark approval for the technology in 2008 and has distributors in some European countries. The company has experienced significant interest and grant funding from US military sources who have seen the benefit of in-field early detection of hematomas. How does Infrascanner Model 1000 work? The device incorporates a scanner that directs near-infrared(NIR) light (a wavelength of light that can penetrate tissue and bone), into the skull. Blood from intracranial hematomas absorbs the light differently than other areas of the brain. The scanner detects differences in light absorption (optical density) and transmits the information wirelessly to a display on a hand-held computer. By comparing the optical density from a series of scans of specific areas on both sides of the skull, a trained health care provider can use the information provided by the device, in conjunction with other clinical information, to determine the likelihood of an intracranial hematoma and the need for further diagnostic procedures, such as a computed tomography (CT) scan. “While patients with suspected brain injuries routinely receive a CT scan, this portable device offers emergency room physicians a non-invasive mechanism to aid in assessing whether an immediate CT scan is needed,” said Christy Foreman, director of the Office of Device Evaluation at FDA’s Center for Devices and Radiological Health. The FDA reviewed data for the Infrascanner Model 1000 through the “de novo” classification process, a regulatory pathway for some low to moderate risk medical devices that are not comparable to a legally marketed device. The FDA granted the de novo petition for the Infrascanner Model 1000 based on a review of data comparing results from 383 CT scans of adult subjects with Infrascanner scan results. The Infrascanner was able to detect nearly 75 percent of the hematomas detected by CT scan. When CT scans detected no hematoma, the Infrascanner detected no hematoma 82 percent of the time. The Infrascanner Model 1000, however, is not a substitute for a CT scan. Future applications for the product include the monitoring of stroke victims using the same NIR technology.